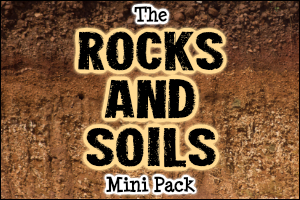 Investigate the life cycles of a range of plants and animals with our fantastic mini pack! 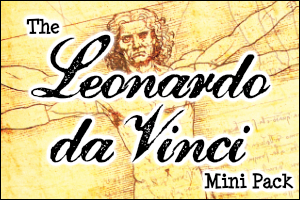 A full topic guide is included, along with a variety of teaching, activity and display resources to use with your children! A Ten Page Life Cycles Guide – A full guide to the topic of life cycles with editable text and clear diagrams. A range of plant and animal life cycles are included, such as a cherry tomato plant, pear tree, ladybird, frog, dog, chicken and human! One Twenty Page Life Cycles Image Pack – A collection of images showing life cycles and stages from the life cycles of different plants and animals. One Life Cycles Glossary – A list of words linked to life cycles with definitions. Use this as a reference resource in your classroom or ask your children to make an illustrated dictionary based on the terms included. Nine Pages of Life Cycles Vocabulary Labels – A set of labels with words, images and definitions. These could be used on a classroom display board, for sorting / grouping activities or during class / group discussion work. One ‘Mix and Match’ Resource – A great activity for sorting, grouping and sequencing different life cycles. Cut out the seven sets of cards, jumble them up and ask your children to put them into the correct orders! Fourteen Life Cycles Labelling Printables – A collection of pages that your children can use to label and describe the stages of different life cycles. Three ‘Life Cycle of a Penguin’ Reports – Differentiated texts that describe the life cycle of a penguin. 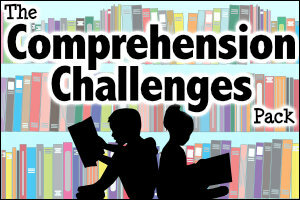 Also include three sets of related comprehension questions. Three ‘Life Cycle of Honey Bees’ Reports – Differentiated texts that outline the life cycle of honey bees. A related cloze activity is also included. Five Life Cycles Colouring Pages – Printable pages that your children can colour. Includes the life cycles of a butterfly, a chicken, a frog, a jellyfish and a sunflower. Eight Life Cycles Banners – A selection of display banners to decorate your classroom walls! 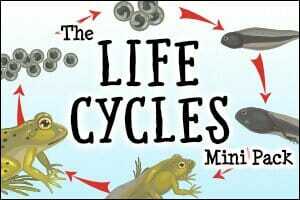 Watch the video below to view samples of resources from the Life Cycles Mini Pack. I have retired after more than 30 years of teaching due to an illness. However my wife is still on the job. Using the packs helped her to widen the array of tools she could bring to her classroom. She teaches P1 to P2(7-8 years). The little essentials, maths and language packs have helped her to brighten up the classroom. Thank you. Yet another really useful pack!!! Thanks very much! Your packs are awesome for my class! 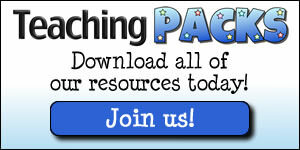 I have been a member for at least one year and I love everything Teaching Packs creates.